Episode 61 - It is the morning of the first day of battle. 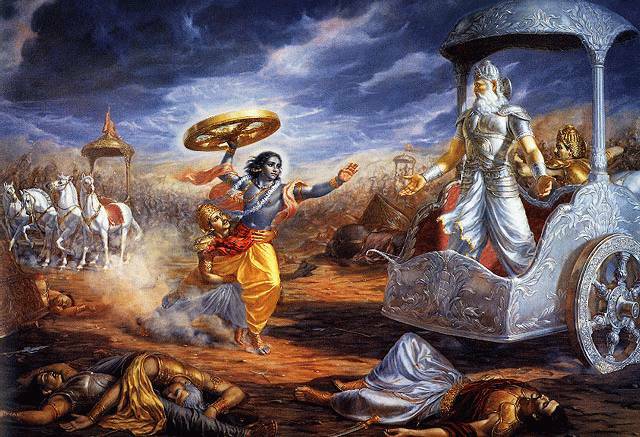 Already Krishna has revealed his great song to Arjuna, and now there are some final formalities, as Yuddistira runs to his elders on the enemy side for their blessings. Krishan tags along and tries to tempt Karna over to the Pandava side, just until Bhisma is dead. It must have been tempting, since it would have given him the chance to even kill the old bugger. But Karna is too loyal to go for such an under-handed thing. He turns Krishna down without a second thought. Finally, just as Yuddistira returns to his lines, he invites anyone who'd like to change sides. Yuyutsu, Dhrtarastra's 101st son, the illegitimate son of a serving girl, volunteers to change sides. Now at least the old king can reasonably hope to have a son who survives this war and can make offerings to his ghost. With this betrayal, Duryodhana starts the fight with a raid directly on his cousins. What follows is a litany of the numerous duels, none of which ended in a fatality, and the violent slaughter of the un-named masses. There is a bloody stalemate until the sun reached mid-day, and Bhisma launched a frontal attack on his enemies. More on that next time!